I’ve seen a lot of frayed or fringed jeans hem pics lately so I decided this would be an easy DIY on a pair of thrifted jeans. I did this on skinny jeans but use whatever cut/style you like. Here’s a pair of distressed Silver jeans I had. I LOVE the Silver brand. Until I discovered them, I rarely wore jeans. They just never fit me properly. I have a small waist and bigger hips so I always had the back gap and that drove me crazy. 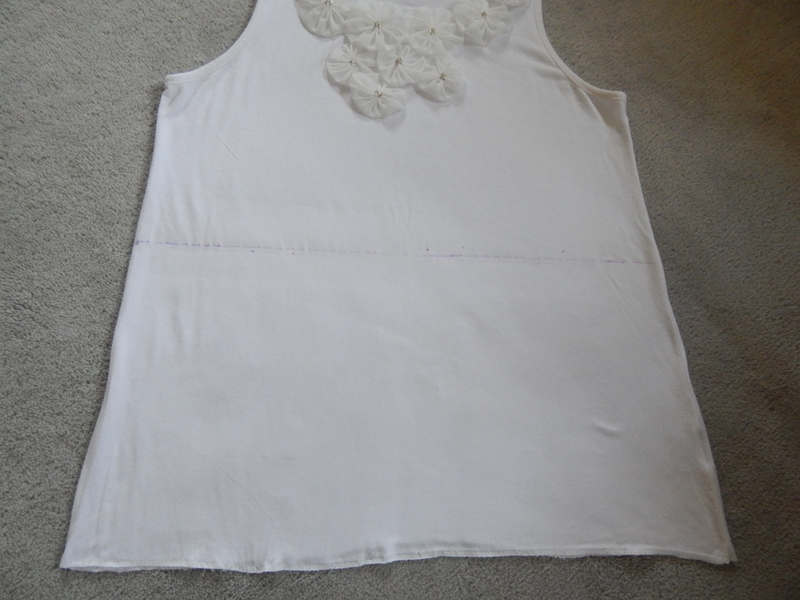 Begin by cutting off the bottom hem and marking where you want your fringe to stop. I marked about an inch or so but you can make the fringe as long as you want. Cut slits up to the mark line every few centimetres. Once you’ve cut slits, use a pair of tweezers or similar tool to start picking at the threads. You want to try and pull the horizontal (white) threads out. Keep picking until your jeans start to look like this. After I was done I washed my jeans before wearing. It helps to clean things up a bit and make the fringe softer. I love the look with a pair of boots. If it were warmer out, I’d wear these with a pair of high heeled sandals and I would cut them a bit shorter so that they look more like a cropped pair of pants. An alternative to the fringe is to just cut off the original bottom hem and not fray them, so essentially step #1 of this post. With time, the unhemmed jeans would just have thread hanging off them. This is another trendy look right now. So easy! So I started thinking, what are the alternatives to donating them to places like Goodwill or Salvation Army or other charity shops? What even happens to these things when we donate them? I have to admit that I’ve never purchased these articles from thrift shops. My hope is that they only put out what looks decent and is in good shape. I mean, I don’t think they should be donated if you yourself would not wear them. I read about a program called Donate Your Bra. This organization collects old bras, lingerie, swimwear and cancer survivor items such as wigs, prosthetic breast inserts and post-mastectomy bras. Fabulous! Except they are located in the U.S. and items must be dropped off or shipped to their location. Not a feasible solution for a Canadian. It seems that Canada is lagging in bra donation and recycling efforts. That’s too bad. There are some organization like YWCA shelters, Red Door, and Interval House accepting donations but will not accept something that is not wearable and in good condition. So what are some other options? I found this article from thebreastlife.com containing some alternative donation places. Worth a read. 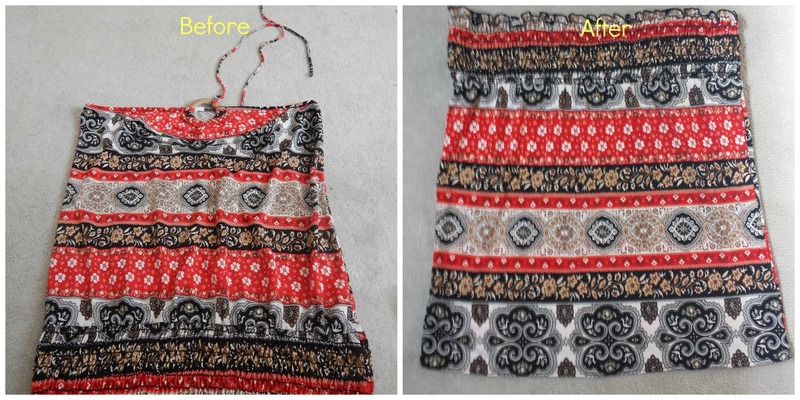 A quick google search also yielded some clever ways to repurpose old bras. I love the idea of adding cups to existing swimwear or camisoles for extra support. I will be doing this for sure! 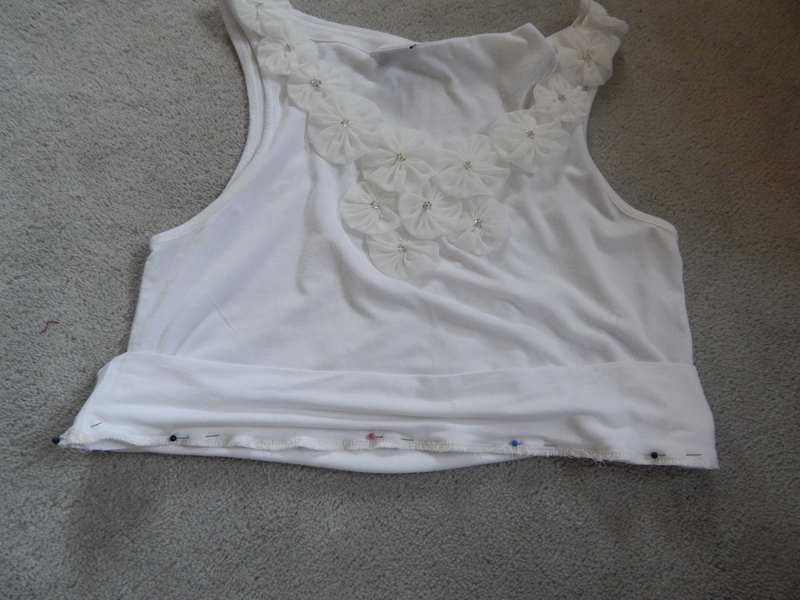 I started with this top from that bag of clothes someone gave me. I knew I wouldn’t wear it as a top. I felt too bare up on top as I simply cannot wear strapless bras and I don’t really like any top that’s gathered at my waist. I cut off the circle holding the straps. Then measured where I needed to cut for the new hem. 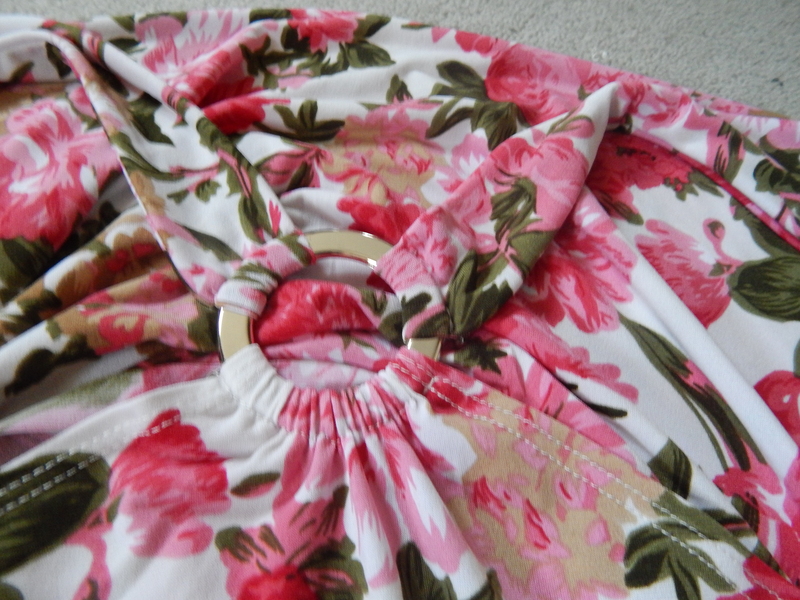 I was going to flip the top upside down so that the elastic at the bottom would become my new waistband. 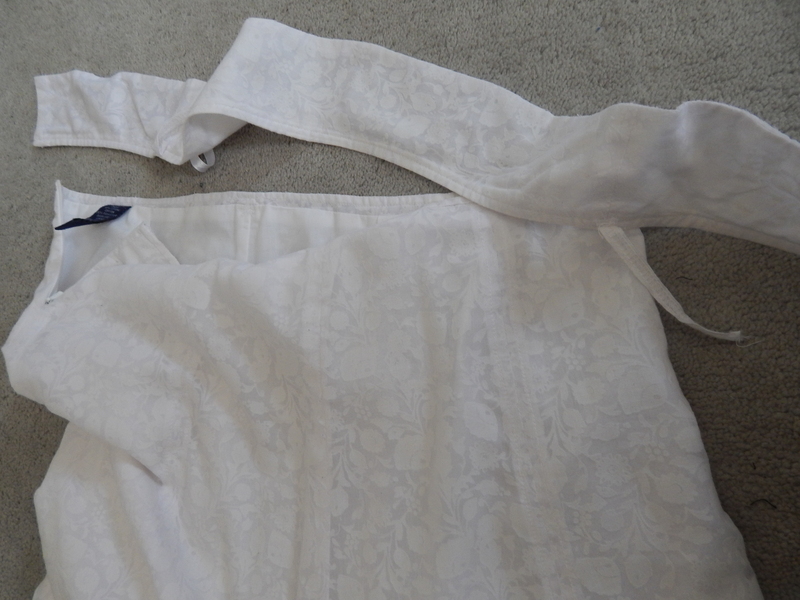 Cutting off the old “bodice” to become the new hem. Fold over and stitch the new hem in place. 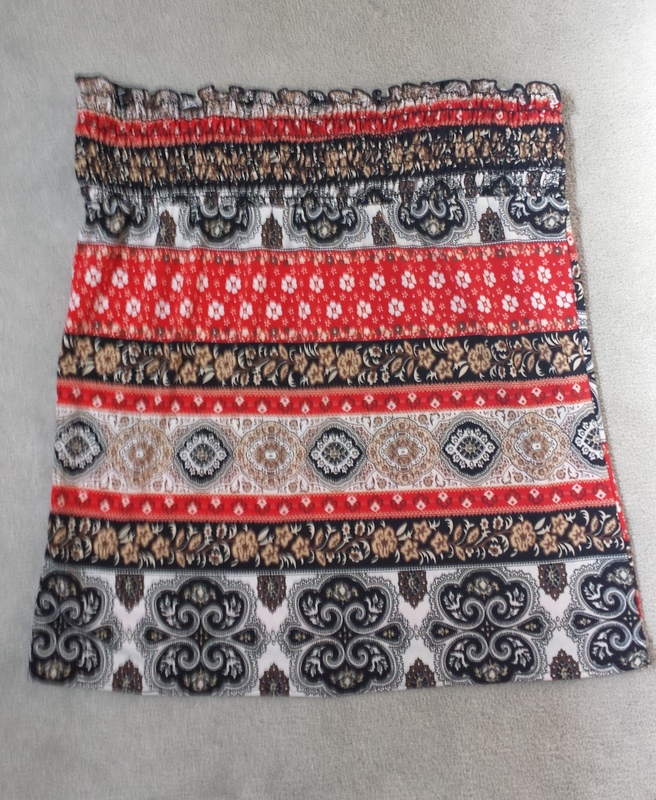 Flip it around a voila…new skirt. Easy! 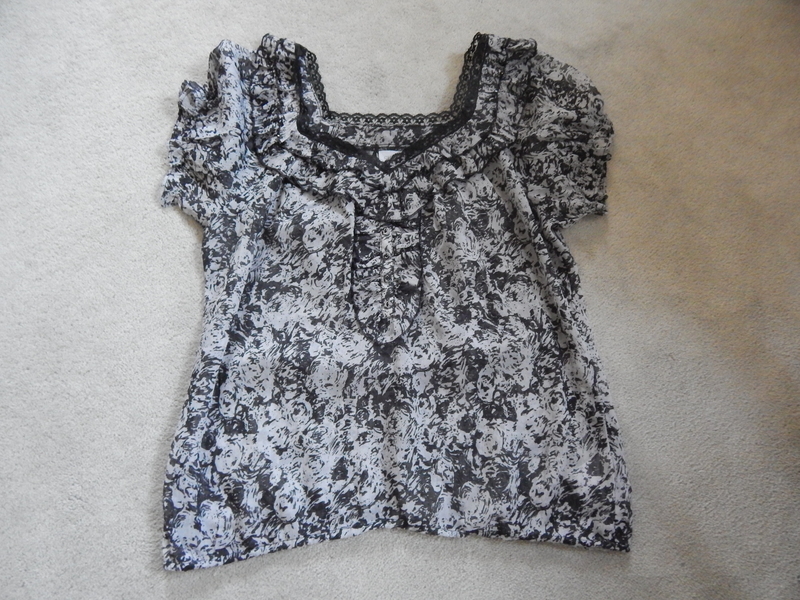 My mom gave me this top a long time ago because it was too small for her. 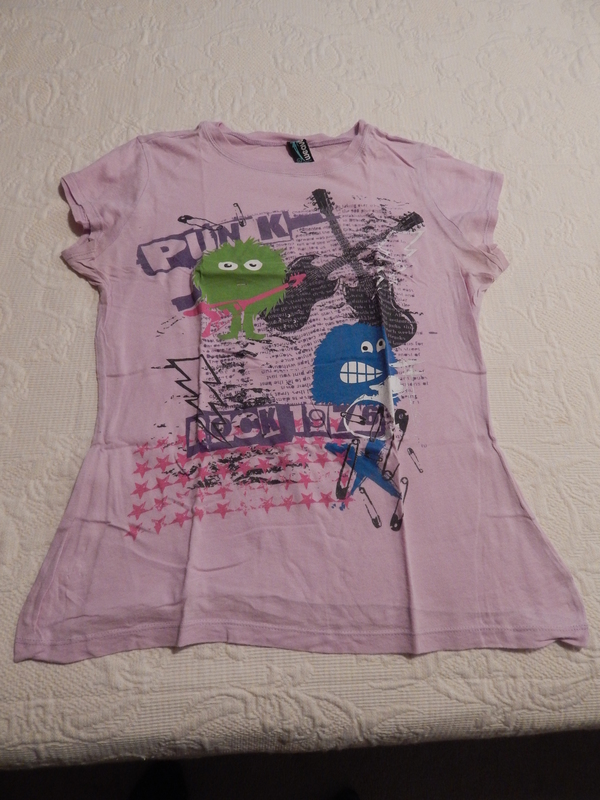 I have hardly ever worn it. I have a thing about wearing sheer sleeves during the winter months. It’s COLD in Canada. I like my sweaters and I just can’t wear sleeves in summer. I wanted to do something with this. 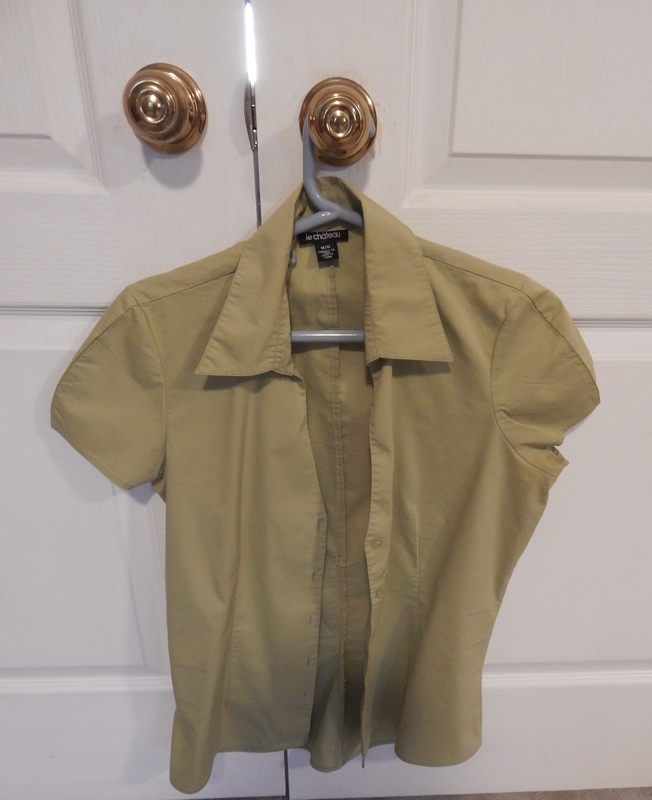 Originally, I planned on purchasing a white skirt and attaching this top to the skirt to form a dress but I haven’t been able to find what I’m looking for at the thrift store. I knew the sleeves were coming off though so I cut those out. Much better but I didn’t like the finish. I found some leftover binding in my stash and thought I’d attach that but it ended up being too bulky so I removed it. I’m still trying to figure out how to finish the armholes. I don’t like the look of unfinished armholes and I find them a little tricky. This is one of those “leave it for a while” projects. Ever get that feeling where you just need to step away for a few days? That’s what’s happening here. Maybe I’ll search for a red skirt on my next thrift outing. Red, black and white colour scheme is gorgeous and classic for a dress. Perhaps the armhole issue will sort itself out by then. If anyone has any comments or suggestions, I’d love to hear from you! So, that bag of free clothes had a few tops that I liked well enough but were too big. Here’s what I did. This tank top was too long for my short torso so I marked where I wanted the new band to be, cut off the excess and restitched the original band back on. Easy! 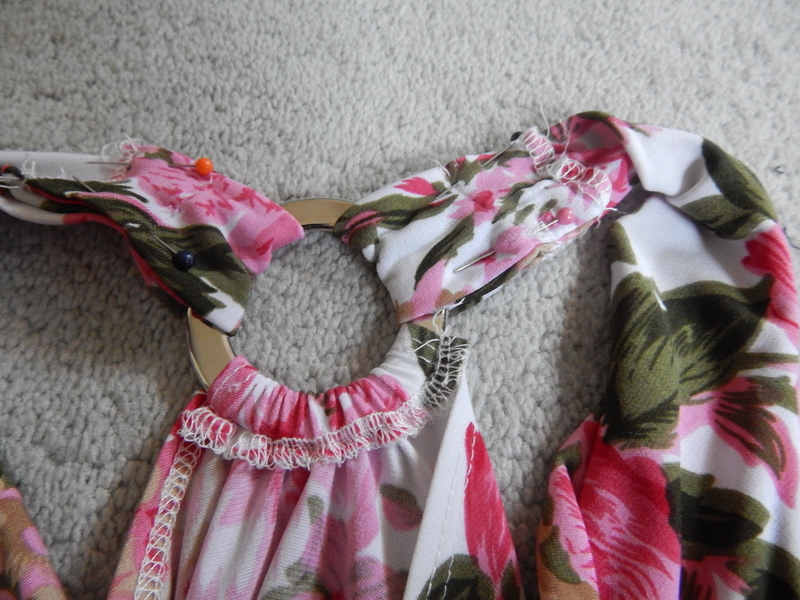 Next was this lovely floral number that hung WAY too low in the front, so I needed a way to make the straps shorter. I removed the circle thing on the racerback that holds the straps up by unpicking the stitching. Then marked how short I needed the straps to be and just stitched it back in place. This sheer floral was way too big all over and it had an elastic waist which I can’t stand. I don’t mind the bagginess of it this time though since I’ll wear a tank underneath. 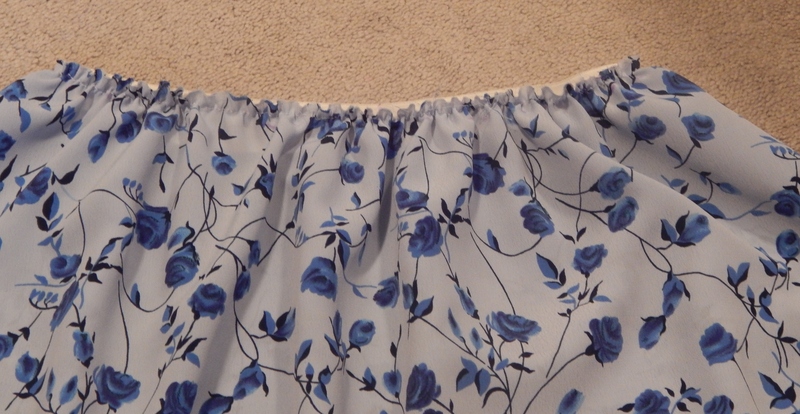 I removed the elastic from the bottom and I didn’t like the ruffle in the front, so that got unpicked. Unpicking the ruffle caused some of the stitching to come out so I had to stitch those back down. Next step: tackle the shoulder seams as it was way too exposed in the front. A few simple stitches to raise the shoulders and done! I’m off on a camping adventure for the next few days but will have more stuff coming in the next while as I try desperately to finish off my furniture makeovers and continue working through my refashioning pile. Happy Canada Day! Happy 4th of July! Happy summer! This is so easy to do. 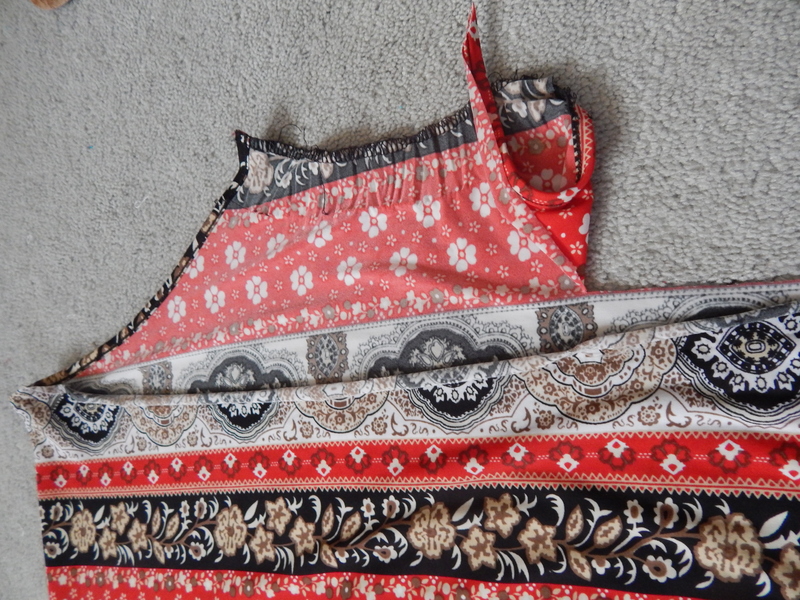 Converting an old T into a tank top. A great idea to reuse a tshirt that’s become stained under the arms or converting oversize (try the men’s section at the thrift store) Ts into workout tops. Begin with a well worn tshirt. Lay it out flat. 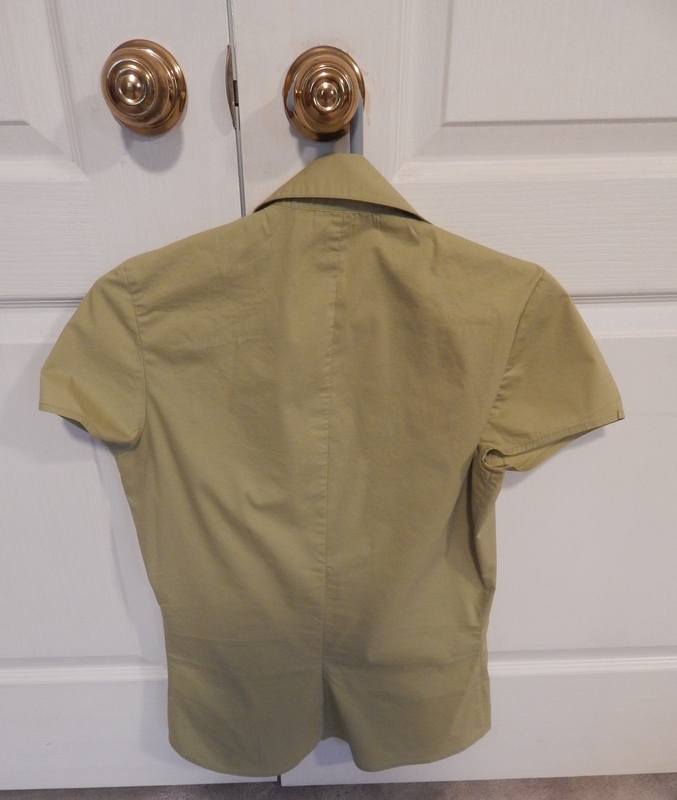 Lay the tshirt out smooth and flat. Use an existing tank top as a guide. 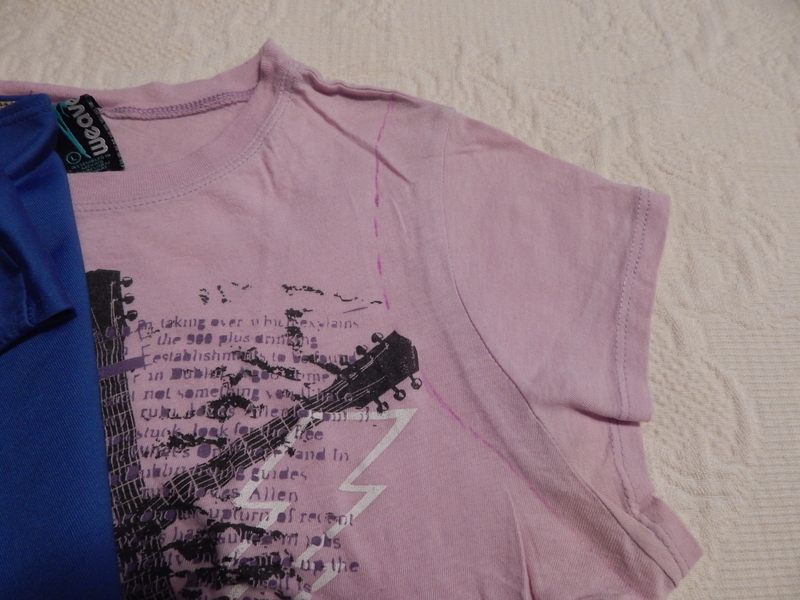 Lay it on top of your tshirt and mark the cutting line. There are 2 ways to do the other arm. Method 1: here, I’ve just taken the piece I cut off and flipped it over to the other side and cut. Cut the other sleeve off. 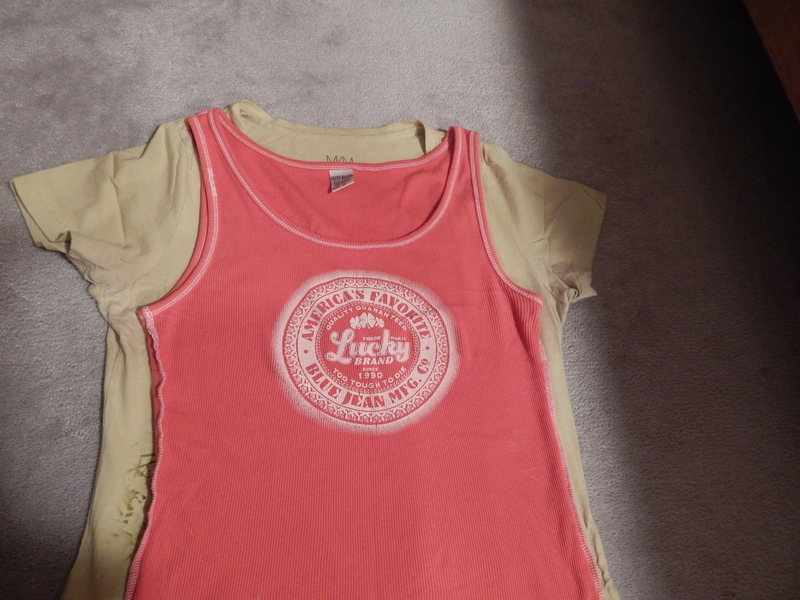 My thrifted Lucky Brand Jeans tank top. Love this colour for summer! I cut the bottom of this tshirt into strips, then pulled each strip until it started to curl. Cut and tug at the strips until they curl. 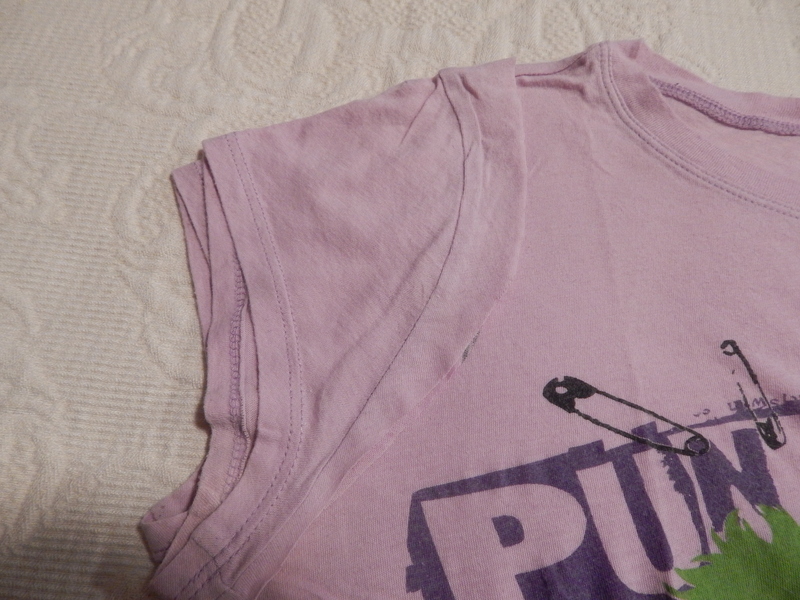 Method 2 for cutting: cut one sleeve, then fold the T in half and cut the other sleeve off. 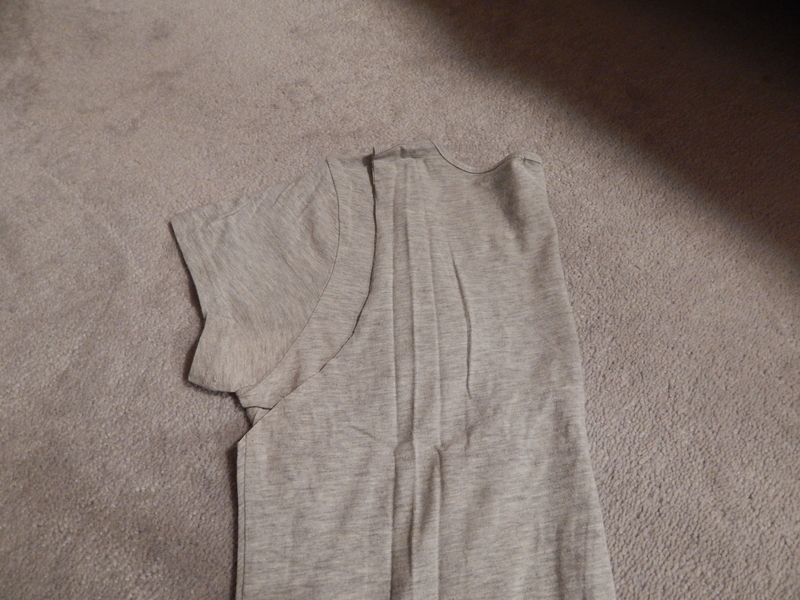 Cut one sleeve off, fold and cut other side. Easily turned into a racer back. 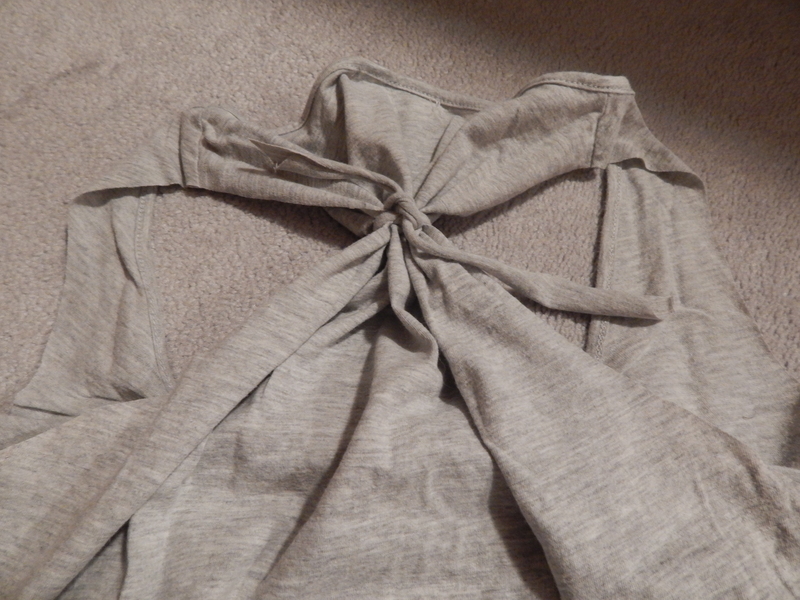 Take part of the fabric you cut from the sleeve and cut into a strip to use to tie the back into a racer back. Strip used to tie the tank into a racer back. That’s it! So simple. No pics of me wearing any of these as it rained all day and I couldn’t go cycling but these are great for when it gets too hot, even if they’re not for working out. I’ll wear something like this any day for gardening or work around the house. I feel very restricted in tshirts during the hot months. I live in sleeveless. 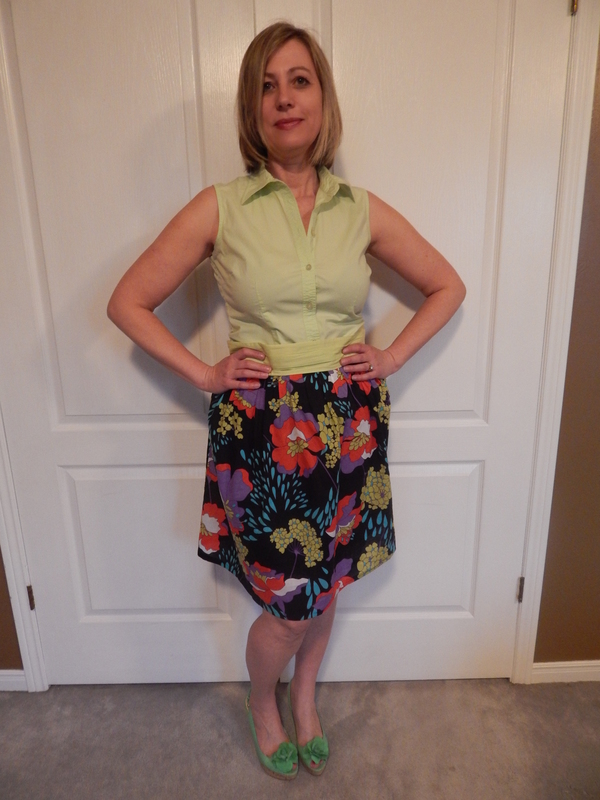 An easy way to fix a skirt that is a little snug in the hips. 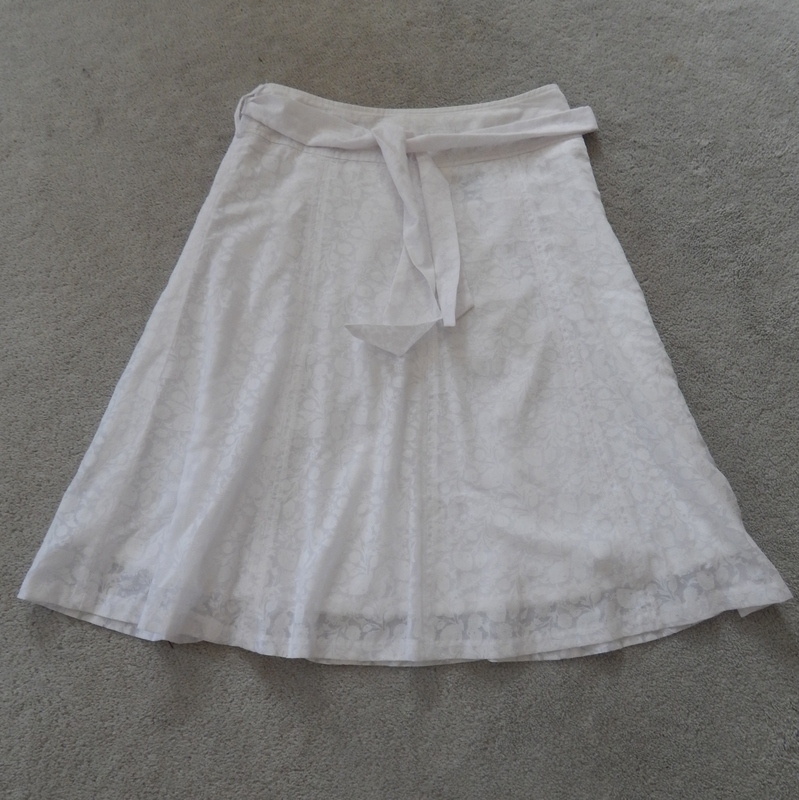 Like this one-a great, lightweight lined skirt that’s perfect for warm weather outings. This never fit me quite right. Like a lot of women, I buy stuff and I settle. I’ve settled with it for years while it just hung in my closet. It’s plenty long enough. This is key for doing this kind of refash otherwise you’ll trade one problem for another (it’ll end up being too short). All I did was remove the upper portion where the sash is (waistband). I literally just cut if off close to the seam so that I wouldn’t have a raw edge to finish. I also removed the belt loops. Part of the zipper got cut off too. That’s okay. Even though the zipper stops have been cut off, all you need to do is use a method to close off the top of the zipper teeth. I simply stitched around the zipper teeth by hand a few times. That’s it. Now the skirt fits over my hips easily and it also fits my waist so I didn’t need any further alterations. Done. Easy as pie. Pie sounds good right about now. Oh wait, why did I refashion this in the first place? Right, because it didn’t fit my hips. No pie! Green is my favourite colour so when I find something in a shade of green that I particularly like, I’ll pick it up. 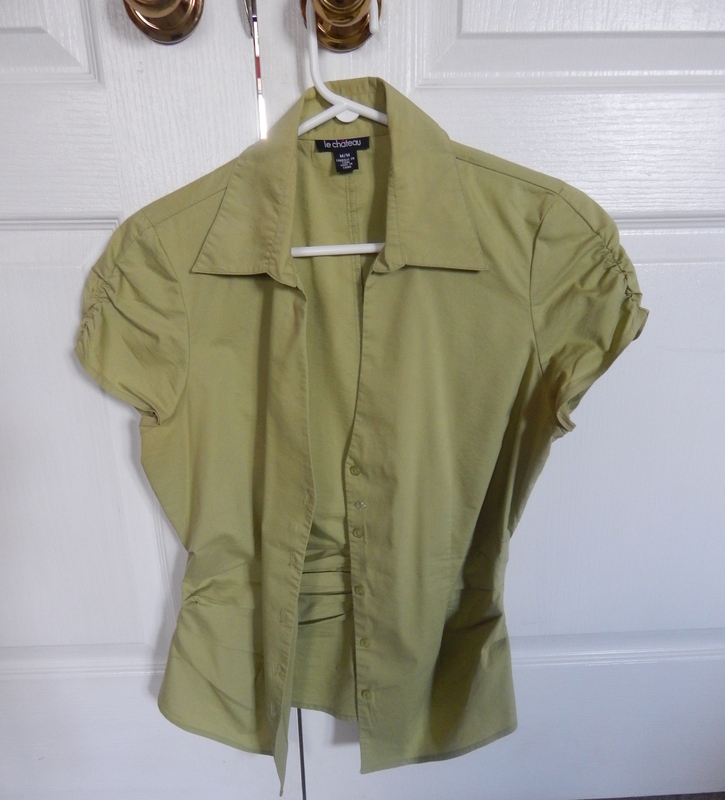 Like this blouse from Le Chateau that I thrifted last summer. I like this shade. 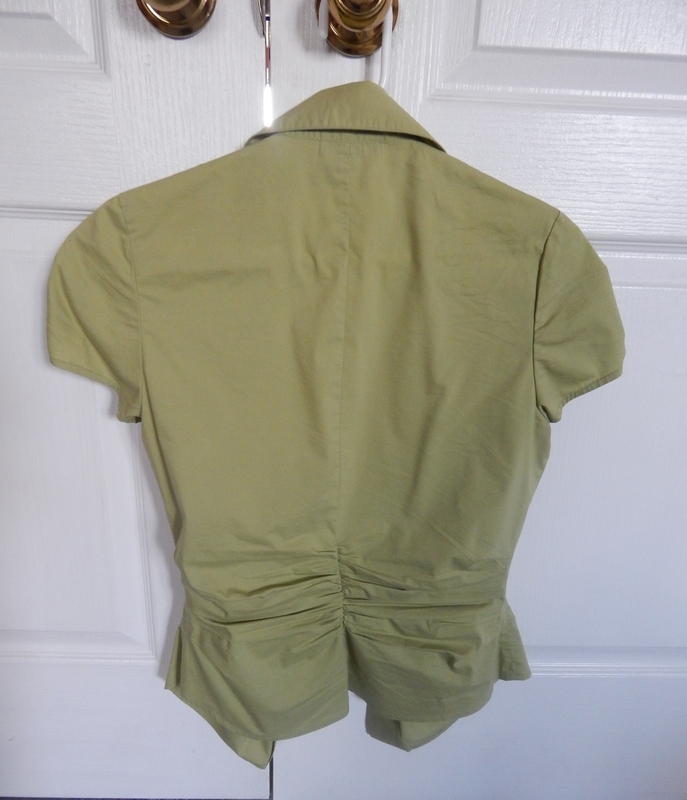 It goes with a lot of skirts I already have but that ruching along the sleeves and the back seam is SO 2004. People who don’t thrift have a preconceived notion that those who do often do not look fashionable or on trend…WRONG! That ruching has GOT to go! It does take a bit of work sometimes but you shouldn’t pass up a piece you like just because of something that is so incredibly easy to fix. 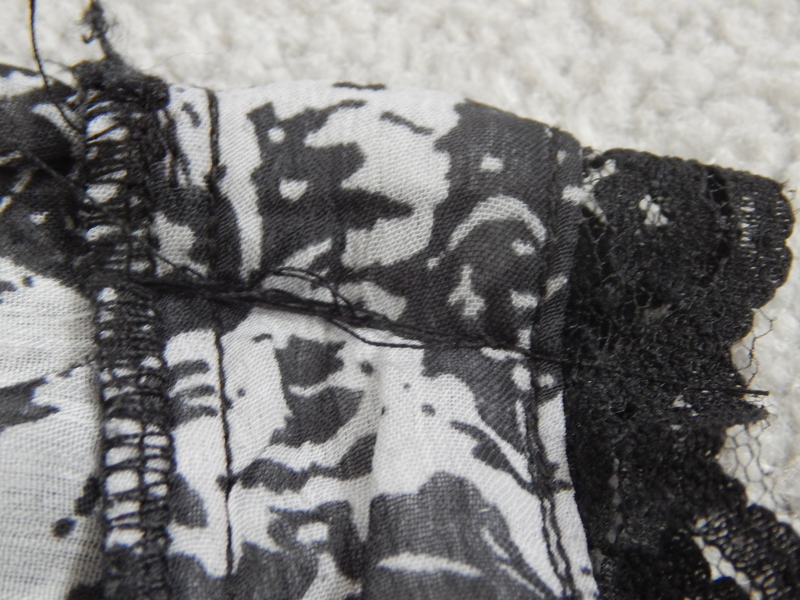 Ruching is achieved by pinning a piece of elastic onto the fabric and stretching as you stitch. This is very easy to remove. Now, I KNOW I took pictures of the process but I can’t find them anywhere! Argh! It’s very simple though. Just unpick the stitching holding the elastic in place using a seam ripper. In my case, the seams on the sleeves stayed in place but when I unpicked the ruching along the back seam it left me with a seam to resew. No big deal. Just stitch it up. 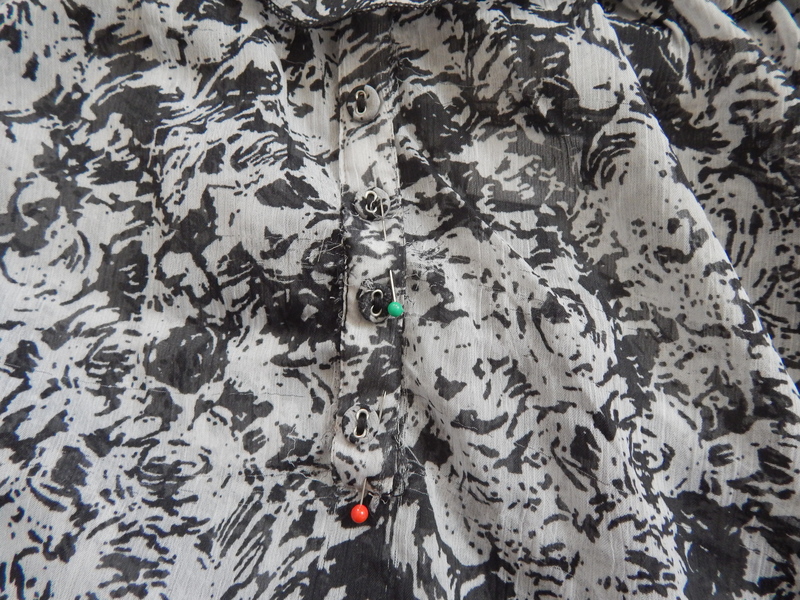 I had a few very tiny holes from the stitching/ruching after I unpicked so I just threw the blouse in the washing machine and pressed it once dry. 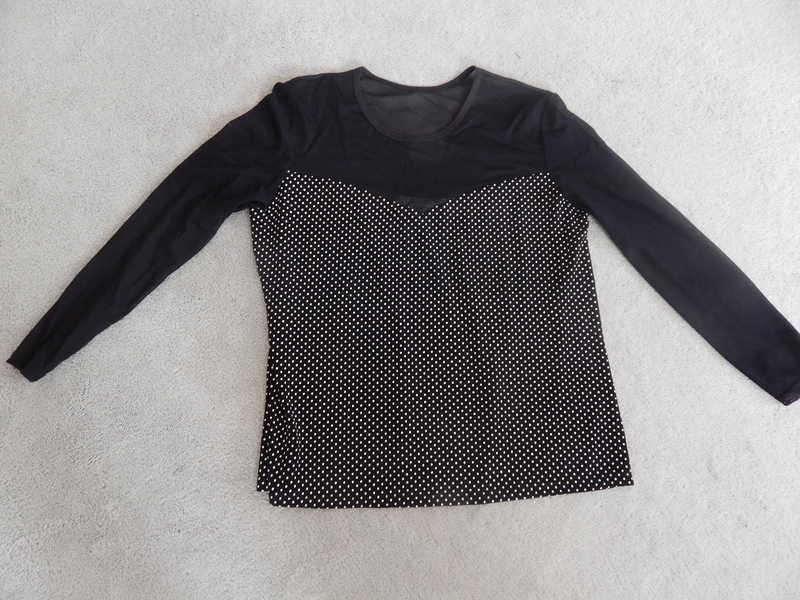 Now I have a simple, streamlined blouse that’s wearable again! 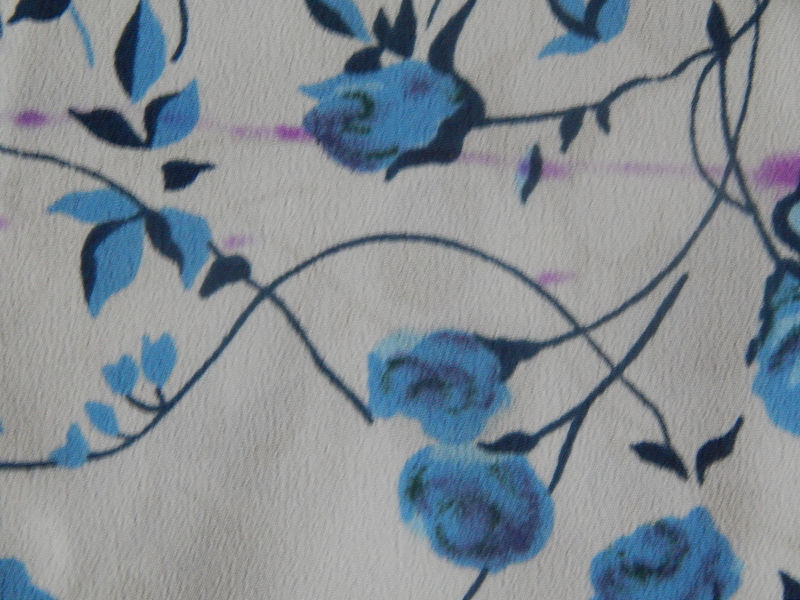 I thrifted this blue rosebud print maxi dress at Talize recently and I knew I would not be keeping it as is. Why do I keep buying florals? Because I love them! I’m a girly girl. I love flowers. Floral prints may very well be my signature style and I’m not going to let anyone tell me I can’t always wear them. I think this is one of the best things about being in my 40s. I feel like I can wear what I want, regardless of what’s “in.” Are florals ever really out of style? I don’t think so. 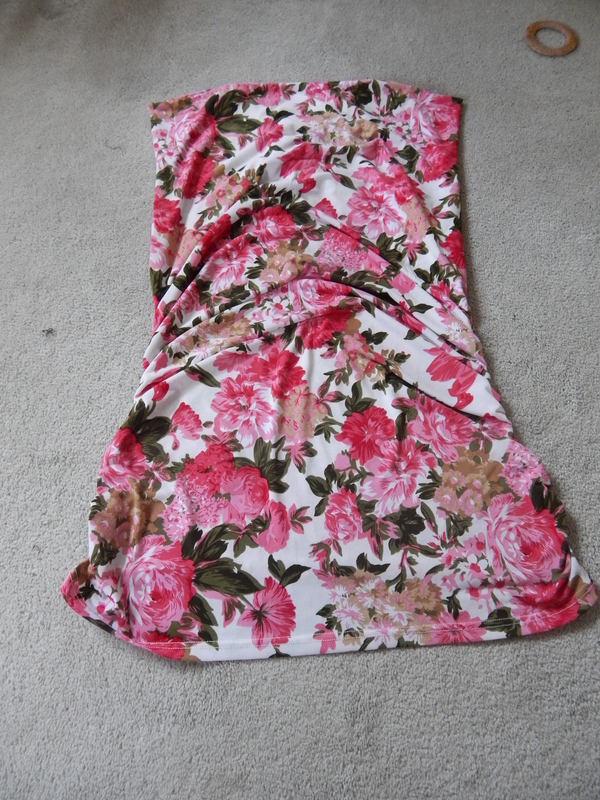 Thrifted maxi dress-one VERY long summer dress! Off to work. While trying the dress on, I measured where my natural waist falls and marked it with fabric marker, took the dress off and placed a pin at the mark. I had already decided that I was going to keep the existing hem. Why make more work for yourself? From the bust seam to my natural waist mark measured to be exactly 15″ so I just measured and marked all along. I then went back and measured a 1/2″ down from my original line. This will be my seam allowance. Leave some room for a seam allowance. I use 1/2″. Next, it was time to cut. Cutting out the middle. There is enough discarded fabric here to make a mini for my daughter if she’ll wear it! You’ll end up with one much larger piece for the bottom of the dress. The fun part is about to begin. Joining the top to the bottom. This fabric would’ve made a lovely maxi skirt. Too late now! Sometimes I second guess my original ideas. 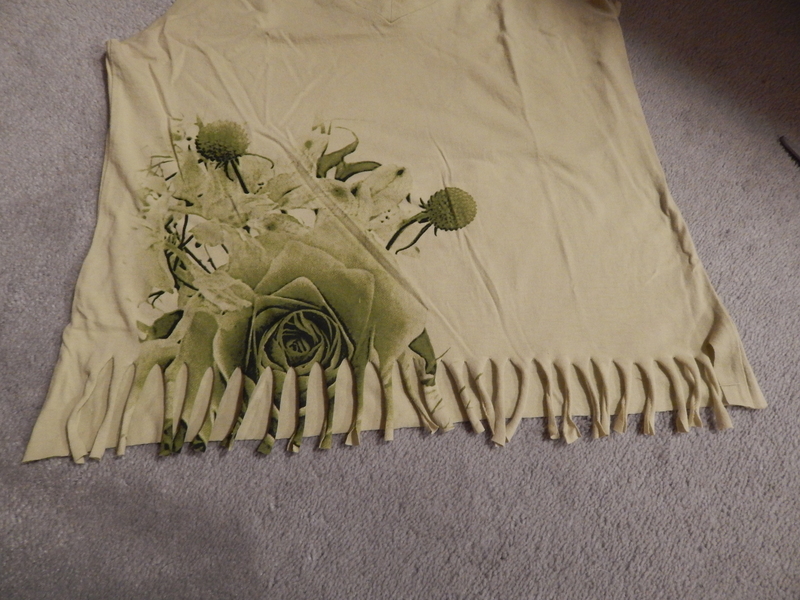 The fabric actually felt like it wanted to be flowy and not straight as it was originally. I decided to insert an elasticized waist. I prefer more structured dresses because I am self conscious about my hips but I’ll try that next. I have the perfect dress for it and can’t wait to create my next refashion. I used some very soft elastic. 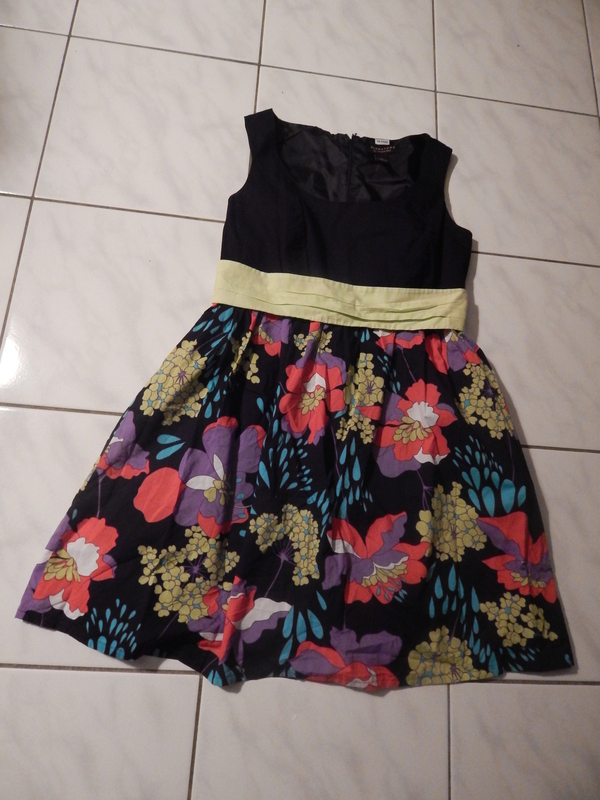 Since it will be hot when I’m wearing this dress, I want the least amount of restriction and chafing possible. 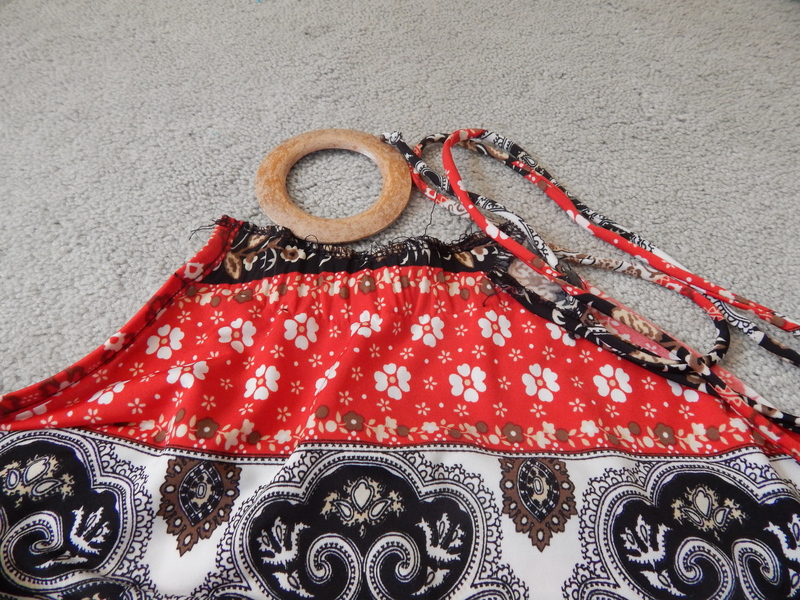 I wrapped the elastic around my waist so it would be snug yet comfortable and stitched the ends together. 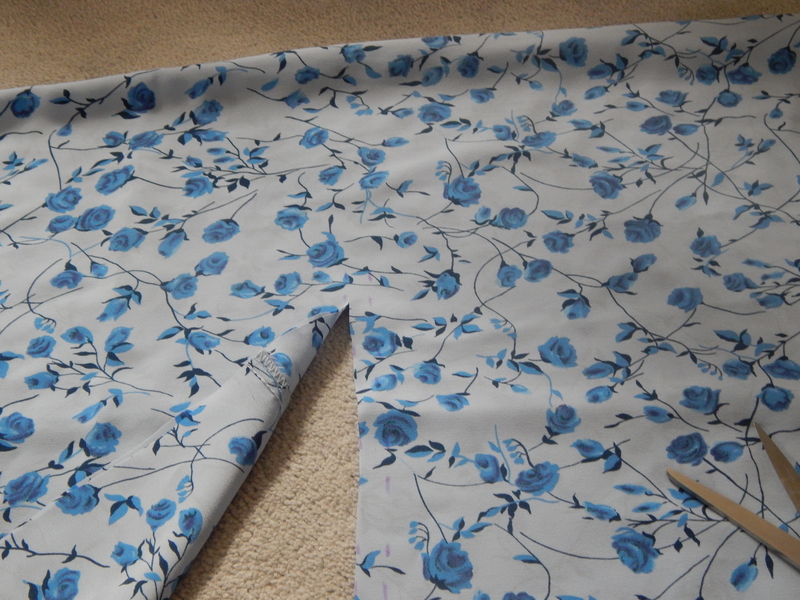 Next, I lined the elastic up with the front and centre backs and side seams of the skirt and pinned in place. 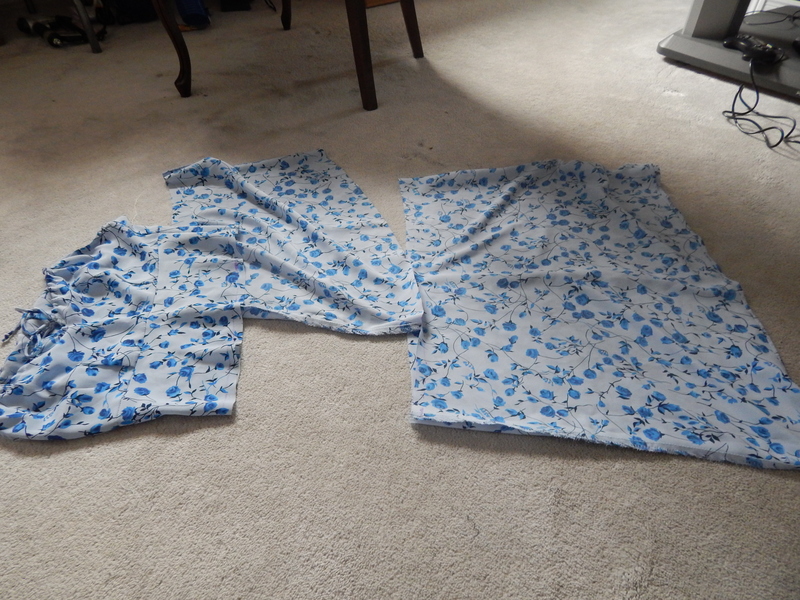 Line and pin the elastic to the front, centre back and side seams. For the next step, some people prefer to stretch and pin the elastic all the way around before they stitch it down. I don’t do it this way as I find that the pins pop out. Whether my method is right or wrong, it works for me. I start at one of the points and stretch and stitch until I get to the next point and continue this way until the entire elastic is attached to the skirt. Once that’s done it should look like this. 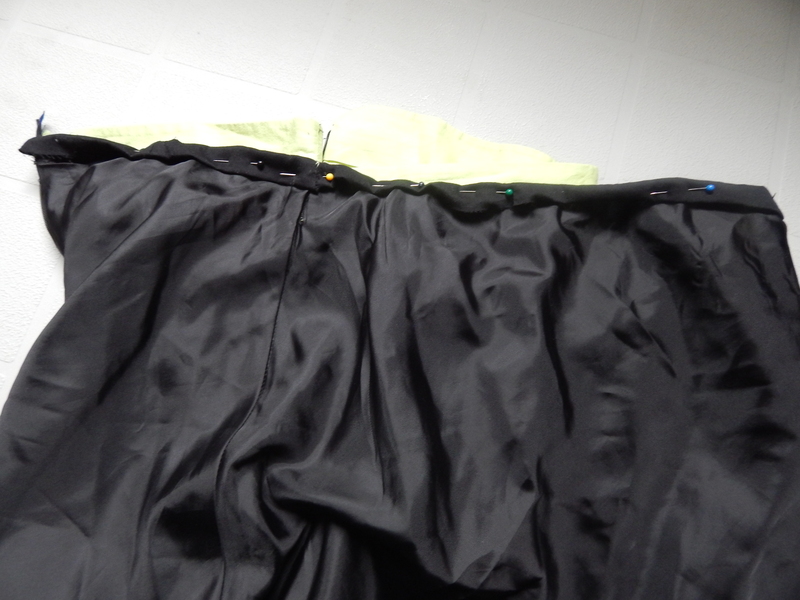 Elastic newly stitched onto skirt. For some reason, I forgot to take a picture of the next step. Basically, join all the side and back seam and centre front right sides together and stitch everything down using the same stretch-as-you-go method. I always have a difficult time getting the seams to line up so I did it this way: I lined up one seam (top and bottom piece of dress) and stitched a few centimetres, then I moved onto to the next seam and continued this way so that I only machine stitched the seam pieces first, similar to how I stitched the elastic in place. I did all 4 points before I stitched in between them. Hopefully this makes sense. I just found it held my seams in place better. If someone knows a better method, I’d love to hear it in the comments. I finished off the inside by snipping off any excess and just running a zig zag stitch along the rough edges. I wanted to finish this dress. 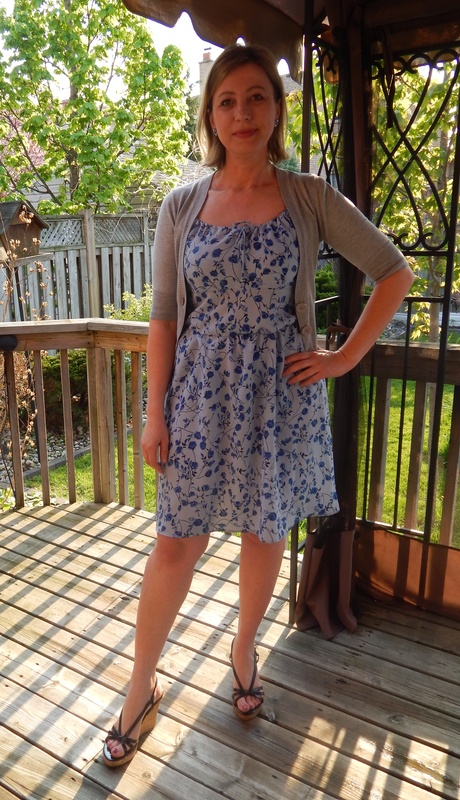 Normally, I would finish off with some seam binding to make it all neater but this is a summer dress and I had a “it’ll do” kind of attitude today. PLUS, I had the most miserable time with my sewing machine today! My thread kept breaking, my zipper foot wasn’t working (for a reupholstery project I have in the works), then the tension got all messed up and was skipping stitches. Today was a holiday in Canada and I wanted to make the most of my day off and EVERYTHING went wrong! Anyways, I changed the needle out and my machine was fine. Go figure! Here’s the end result. I looked for a black belt to match since the print has some black in it. I don’t own many belts so I’ve added belts to my thrifting list. By the way, thrift stores are great places to buy belts at good prices. 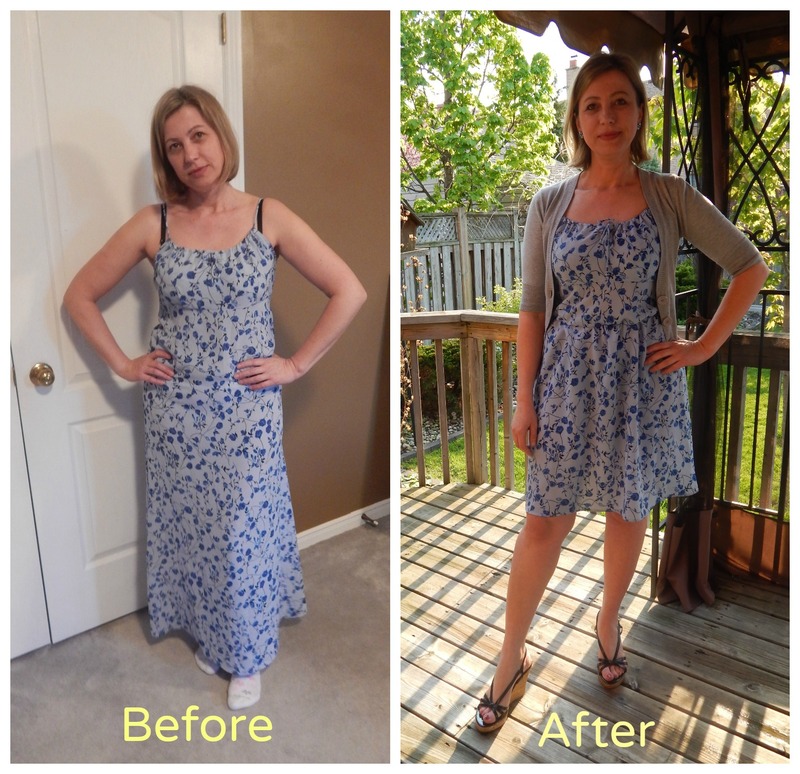 Refashioned maxi dress. Belt: thrifted @ Talize, Wedges: Steve Madden also thrifted @ Talize. Would look nice with a denim jacket. Too bad I gave mine to my daughter. She turned it into a vest. Dress sans belt. Cropped cardi: mine (old). I’m pretty happy with how it turned out. A lot of the clothes I used to buy before I started thrifting and refashioning are impulse buys or things that I bought because I had an event to go to and “nothing to wear” which often resulted in mad dashes to the mall to quickly go in, grab something and get out. You know what I’m talking about. There are people who love to shop and then there’s me. I love to shop when I’m just browsing. I hate to shop when I really need to find something. When I’m not looking or it’s not in the budget, everything looks great and I want to buy it all up. When I’m under pressure and looking for something specific, of course I can never find it. That’s the story of this dress. I needed something for a First Communion and bought this dress a few years ago. It was alright. Nothing special. Here’s a picture of me actually wearing it at the event. Yes, I was brunette here. Another fashion mistake (of a different kind). Every time I colour my hair brunette I vow it will be the last time. That definitely was the last time. Just like this dress really needed to be a skirt, I really need to be blonde. The so-so dress. Nothing particularly special, though it does have a very colourful print. I thought chopping the length would do the trick, so that’s what I did. 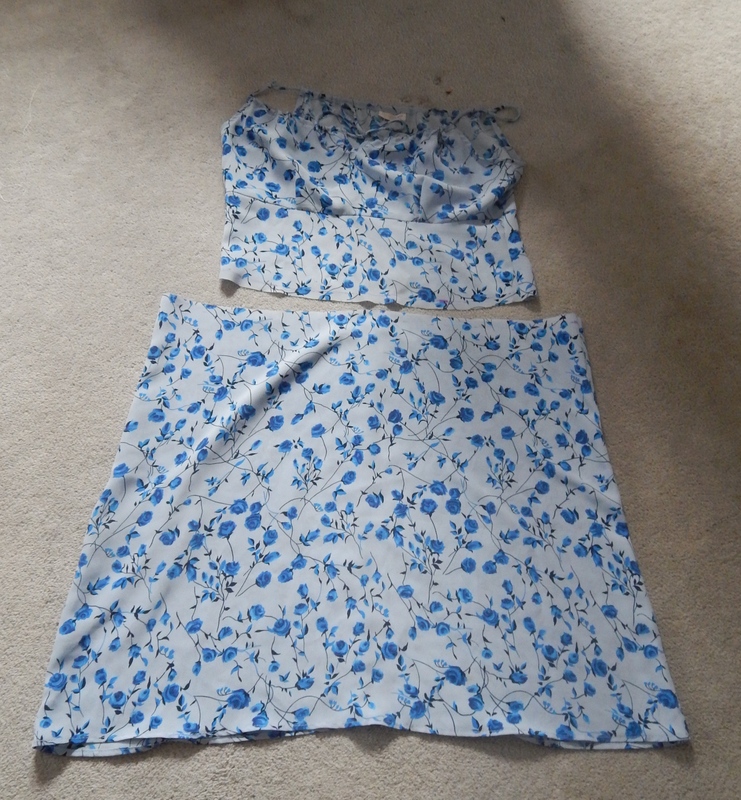 Dress with some of the length chopped and hemmed. I still didn’t like the way it looked but look at that print and those colours. I had to do SOMETHING with it. 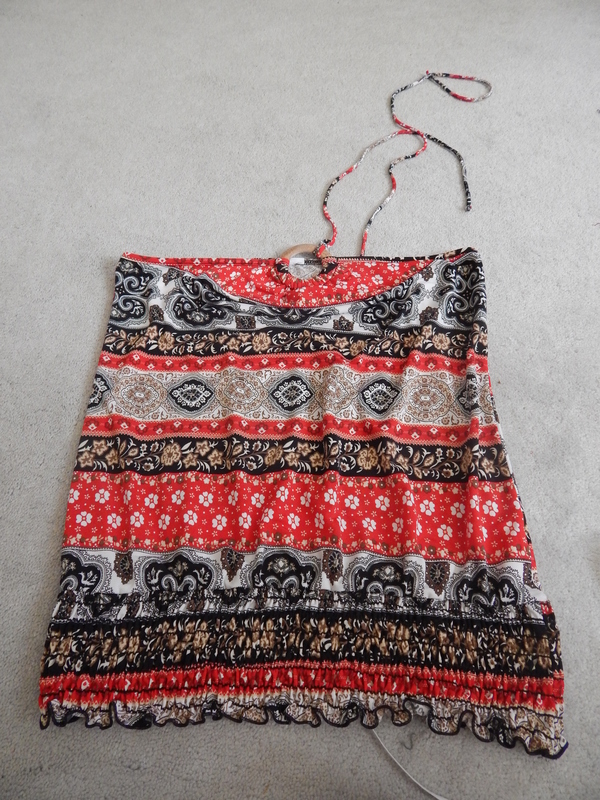 Since this dress had a zipper on one side, I had to cut the top of the zipper off as it was too long for the skirt. 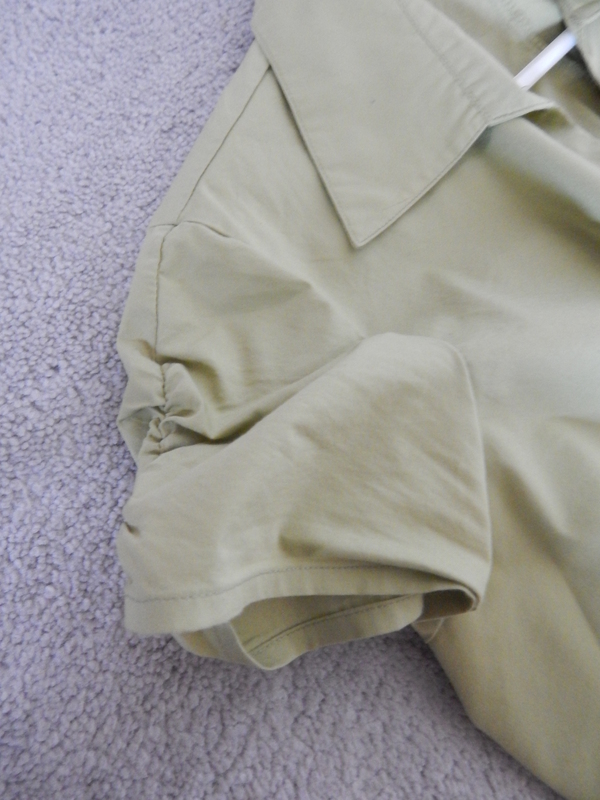 I folded the zipper over and stitched it place underneath the new waistband. You have to fold the top of the zipper over, otherwise when you zip your new skirt up the zipper will just come right off! Another option to folding the zipper over is to stitch the top teeth a few times by hand so that the zipper has some sort of stop to keep it from coming off completely. That solid green part of the waist was then handstitched in a few places just to secure it further. Now-much better. There are so many colours to pull from for top options. I need to do some serious shopping for summer tops. I like it so much better now. What do you think of my green shoes? I wish I had taken this picture from a different angle so you could see the heel. They’re Nine West from last summer. This is the last of the dress to skirt refashions. I’m tackling some more challenging dresses (that will stay dresses but be completely transformed) next. Can’t wait to work on them and post the results here.